Founded in 1996, Nā Kālai Waʻa o Kauaʻi (NKWoK), or The Canoe Builders of Kauaʻi, is a non-profit organization dedicated to the perpetuation, practice and exploration of the seafaring arts and skills of the ancient Polynesians. Starting in the late 90’s, Nā Kālai Waʻa o Kauaʻi began the construction of Nāmāhoe, Kauaʻi’s voyaging canoe, which launched in September of 2016. Constructed to mirror the crafts used by ancient Polynesians in their navigation of the Pacific, Nāmāhoe was built to provide the people of Kauaʻi with regular access to a proven educational, cultural and inspirational resource. Nāmāhoe is a 72-foot long, twin-hulled, long distance voyaging canoe, currently docked at Nāwiliwili. 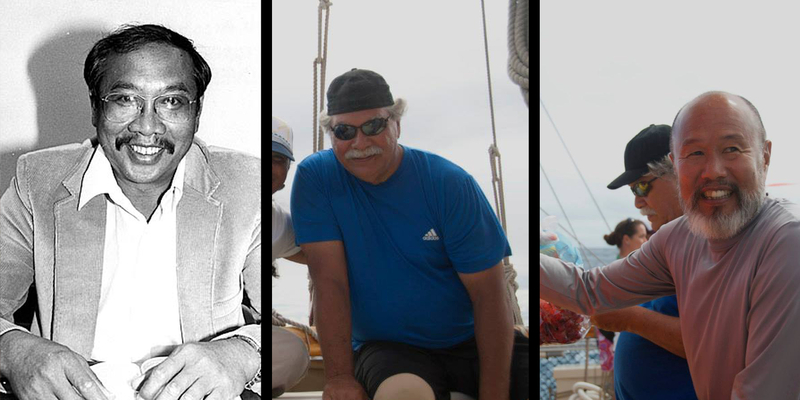 The organization’s founders are members of long standing in the Polynesian Voyaging Society (PVS), many of whom have been crewmembers on the Oʻahu-based Hōkūleʻa since the late 70’s, 80’s and onward. The project began as a dream shared by Dr. Patrick Aiu, Mr. John Kruse, and Mr. Dennis Chun during the voyages on Hōkūleʻa in 1992 and 1995. Upon their return from those voyages, the trio organized Nā Kālai Waʻa o Kauaʻi, shared their vision with others, and solicited support from various sectors of the community.